Annual filings are used to project resource needs as state and county governments plan for the future of the citizens served by the Sixth Judicial Circuit. The filing statistics are reported to the Office of the State Courts Administrator (OSCA), which also collects information on population, number and assignment of judges, case disposition, clearance rates and county-by-county comparisons. Statistics are reported under Florida Supreme Court uniform guidelines known as the Summary Reporting System (SRS). While SRS numbers are used for workload assessment, they are not intended to measure the efficiencies of the judiciary, state attorneys or public defenders. 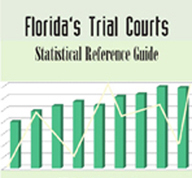 OSCA annually publishes statewide SRS statistics in the Statistical Reference Guide to Florida’s Trial Courts.